Ten years ago, Mike Fintak and Charles Castle started Burg Baseball with a mission: Get more low-income kids in St. Pete playing baseball. After 15 years with a local Little League, Mike was dismayed with not only the lack of young African American ballplayers, but also the exorbitant costs to play the game, which essentially barred eager young players from participating. He noticed some key problems. First, there was little recruitment in the midtown and southern areas of the city. Also, fees to play were costly and didn’t even cover the price of new equipment like bats and gloves and cleats. Unfortunately, things haven’t changed much since then. To Mike and Charles, this wasn’t acceptable, so they decided to do something about it. It wasn’t right, they said, that so many talented children were being shut out of America’s game because they simply couldn’t afford the entry fees. Mike and Charles knew that baseball could serve as a vehicle not only for athletic improvement, but also for life skills like discipline and determination, skills that could translate from the classroom to the streets, and beyond. Skills that could help mold these kids into adults who could grow up knowing not only to love the game, but to love the communities that foster it. It’s been ten years, and those promises came true. The organization now serves hundreds of kids – 11 teams with players from 4 to 16, from T-ball to travel teams that regularly play against the best competition Tampa Bay has to offer, many times against those same teams that Burg kids couldn’t afford to join. We’ve graduated more than 25 kids to high school ball. You’ll never see Burg turn away a young person who wants to play the game but can’t afford it. Just last year, MLB All Star and Florida native Andrew McCutchen reflected on the way his sport is pricing out talented youth. 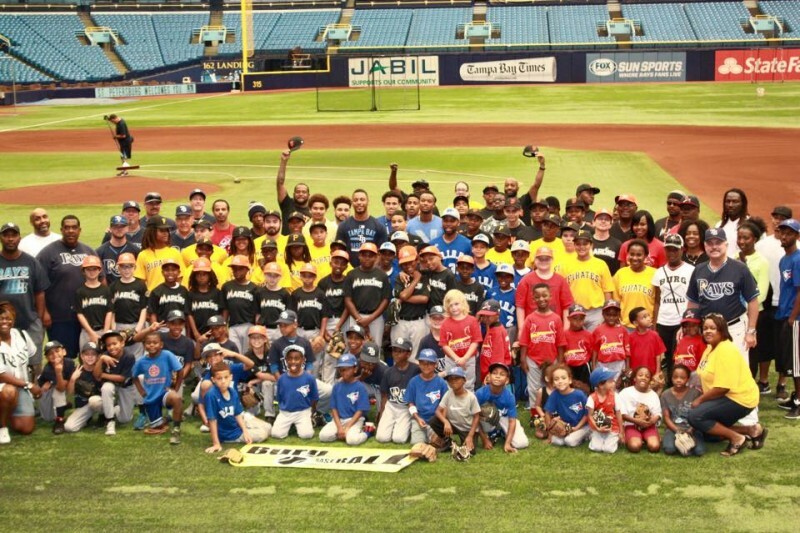 Our organization wants baseball to be accessible to everyone, regardless of socioeconomic background. We’re used to being the underdogs. We’re used to playing with hand-me-downs and used gear. We’re used to running thin, even with the generous backing of our community partners. Between insurance costs, field fees, tournament entries and umpire expenses, it takes a lot of time and especially money to run a baseball league. We are a 501(c)3 that relies on donations and 100 percent volunteers to keep going. Our friends and family members work at Tropicana Field to help pay for fees, operating a concession stand to raise money each year. Since 2007, Burg volunteers have put in more than 34,000 hours to help more than 1,800 children play baseball. Our scoreboard consoles are older than a lot of our kids. Same goes for the pitching machines and some helmets and bats. We get by with old bases and chalk machines, we’ve even shoveled our own dirt for our pitching mounds by hand. This year, with Burg a decade old and bigger than ever, we want to make sure the next ten years are even better. We want kids taking the field with the best gloves and bats they can possibly have. No more mud-caked catcher's gear that's been shared among a dozen players over several years. No more smelly helmets with peeling foam. We’d like to say goodbye to the bats with chipped paint and ripped grip tape, even though they’ve served us well. This is where you come in. The tools of the sport are necessary to set these kids on the path to success. Running onto the field with equipment they can take pride in is very important. Burg is only as good as the support it gets from people like you. If you want to be a part of something great, please consider donating to us. Please consider helping us out, so we can make it easier for kids to get involved in the game. You never know, we could have the next Andrew McCutchen or Chris Archer right here in St. Pete. Let’s make sure he or she gets a chance to play the game. Hey all -- many of you may have seen, but vandals broke into Burg's main concession stand this weekend. We were stocking up as fall ball revs into gear. Police came out and estimated about $2,800 in damage. Coaches Charles and Cliff talked to many local media stations. Read about the burglary here: http://www.tampabay.com/news/publicsafety/st-petersburg-youth-baseball-concession-stand-vandalized/2338767 As always, thank you so much for your kindness and support of our mission. Hi all! Burg's 2017 season has begun! We're still always looking for help -- in donations, volunteer time and new players. As always, follow us at burgbb.siplay.com. Thank you and go Burg!! Hello all! Burg's 2017 season is starting soon! We'll be back on the fields at the Lake Vista complex Jan. 3. Hi all! What a year it has been. Burg had more players this year than ever before. We had several All Star teams that competed in postseason. It's all winding down now, and we're refocusing on fundraising in the offseason. Once again, we are so grateful for your kindness and for visiting this page. For some exciting fundraising updates, check burgbaseballstpete.com. More soon! Go Burg! Happy to help the children. We were sorry to hear about the vandalism.